Steve Martino’s work is strikingly thoughtful with little need of explanation. It is skillful without reliance on, or reference to, the latest imagery of the status quo. It is self-aware, but appropriately so – the result of careful, often intuitive consideration, free of inane archispeak, pettiness, and self-indulgence – wholesome responses to the present and contiguous to both past and future. If they weren’t so well orchestrated one might imagine his landscapes having evolved naturally. And perhaps this is the essence of Steve and his work –direct, unaffected, and in keeping with natural forces. I met Steve in a sculpture class at ASU in the late 1960s, and a bond soon formed between us which has endured to this day. I suspect the spark that ties us together is not unlike the spark that ties so many of us to the greater landscape. It is this special inherent sensibility that enables Steve’s greater vision to see through and beyond the obvious. Steve’s interaction with the desert dates back to his troubled delinquent youth and life at the Arizona Boys Ranch where one of his duties was horse wrangling. Lone rides into the desert made unique impressions that helped direct his course and life’s work. Years later, after dropping out of architecture school, he began to question why Mediterranean landscapes were so ubiquitous when the existing desert plants seemed more interesting and didn’t require life support of water, fertilizers and insecticides. This led to an early career of pioneering work with largely unsympathetic clients and almost no source for the native plants he sought. Backpacking trips around Northern Mexico to gather seeds in the wilderness was his solution and this “can do” attitude continues as the barometer of his life and work. No cheap talk, no excuses, just doing what needs to be done. This monograph documents the work of a truly engaged and committed designer. 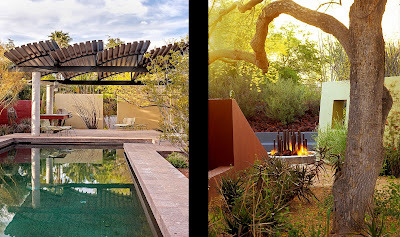 Steve Martino is a landscape architect’s landscape architect. His work has a depth that is rare to find in this day and age. It not only solves his clients’ immediate requirements, but does so with an awareness of the greater context – the landscape as far as the eye can see – the landscape in tune with the way the earth turns – the landscape as compassionate with fellow life forms inhabiting the region. This book not only documents a portfolio of wonderful work, it allows us a glimpse of how we might see ourselves as a species among species in gardens where man and nature can meet with compassion, if not as equals.